I’m starting at the beginning with a bit of keyword research, for a potential client offering porta potty rental services in the Inland Northwest. So this isn’t perfect math by any means—but let’s go with a rough estimate of $225/toilet/day. I’m going to make a few other assumptions just so I can work the math. From there I can make a guess at average value per sale. Ok a bit of a tight funnel. And we haven’t yet added a filter to look at only local traffic. This is pretty low volume. Turns out not a ton of people searching for porta potty rentals. And actually sort of intuitivity, significantly higher volume in the summer months. So there are a few options we could look at here. We’ve done this before for other projects where things are tight. 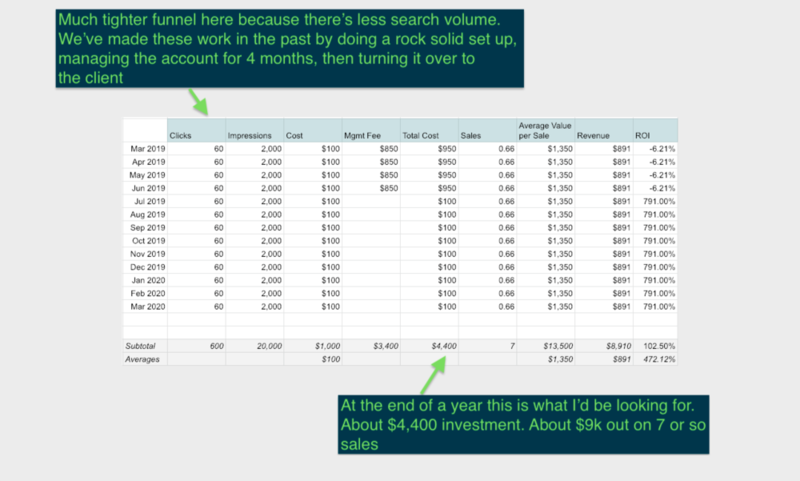 Basically we spend 3-4 months working the account—get it into solid shape—then turn it over to the client. I’m noticing these guys do way more than porta potty rentals. 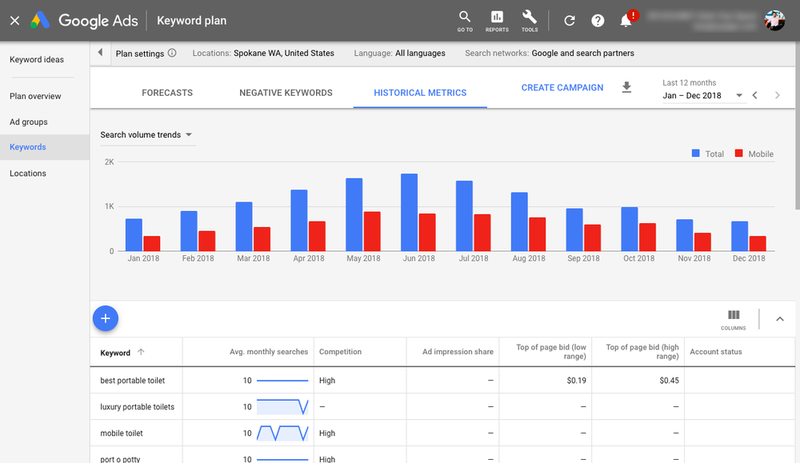 If we looked at advertising for more of their service offerings they could get a better bang for their investment to hire professionals to set up and manage their Google Ads account. Just by adding one more category—Septic Service, I’m starting to see increases in monthly spend, clicks and conversions. I wouldn’t be offended. The business could come back and say our average sale is $10k instead of the $1,350 I used for the model. That obviously changes things! This one needs a bit more consideration before moving forward. It’s not a no-go by any means, but want to make sure we set everyone up for success. My vote would be Option 2, to expand the scope of the advertising.